CDOT distracted driving message contest. C: DON’T DRIVE DISTRAC … SQUIRREL! As of Wednesday afternoon, 670 people had posted comments. Some of the commenters, like Donna Singular Collier, wrote that they didn’t like any of the choices. Collier wrote that she would prefer more serious messages rather than cute ones. Many commenters, including Zackery Ford, who also did not vote for any of the four choices, wrote that the signs themselves are distracting. A commenter named Joe Prinz writes that as a truck driver, he sees many people texting while driving, including other truck drivers. He says it is a shame that there is never a law enforcement officer around when he sees drivers texting. He believes the signs do not deter drivers from engaging in distracted behaviors. And Jeff Lamson writes that a better way to deter distracted driving is to make the offense a mandatory $1,000 fine and a six month license suspension. 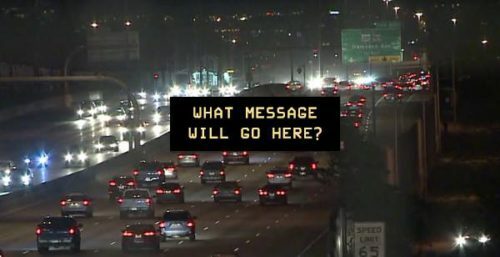 Other commenters continued to suggest messages that CDOT might want to choose for future votes, such as Francisco Sebastian’s “ALERT: Crash ahead if you use your phone.” And Emily Farrington, while voting for message option C, suggests that the messages be broader than just about phones, because there are many other things that distract drivers, such as pets and children. Engaging in grooming behaviors like putting on make-up and shaving. Distracted driving is dangerous and leads to accidents causing serious injuries and deaths. In 2013, 203,827 drivers in Colorado were involved in accidents of all kinds, and 24.4% of road accidents were caused by distracted drivers. Alarmingly, the number of distracted driving accidents increased in the state by 9% from 2008 to 2013. The act of texting (whether sending or receiving) prevents a driver from looking at the road for an average of 4.6 seconds. At a speed of 55 miles per hour, that is like driving the length of a whole football field wearing a blindfold. To save lives, CDOT urges everyone to share its many materials, such as brochures, posters, logos, and Spanish language materials, to help cut down on distracted driving.